Best Harlem Shake video ever!!! I have been a subscriber of this dudes vids before I even got into yak fishing. Seeing what this guy catches in HI made me get into the sport. Dude's a beast when it comes to yak fishing and I recommend you all to check out his Youtube channel. I hate those harlem shake videos, but this one I can get down to. Enjoy. http://www.reddit.com/r/kayakfishing - Help the kayakfishing community grow! This guy has some of the best kayak fishing vids on YouTube. Is this the first time you've seen this guy's channel? 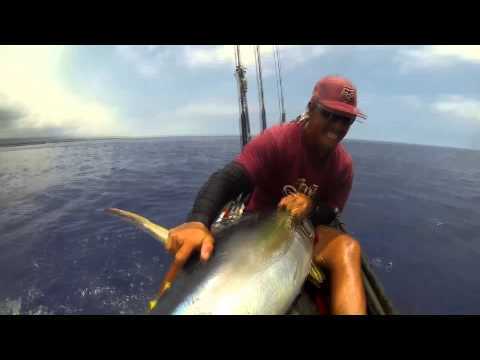 Did ya see the one where he gets a 112 lb and a 71 lb yellowfin in the same afternoon? Sick! Hey I noticed in another video that this guy shows a Bonito look-alike he caught which apparently they call "kawakawa" in Hawaii. Now that's a tuna. Dang! Who else is jealous about how close to shore he is when he's pulling tuna 3 times bigger than ours up?